Wikimedia Commons has media related to Altar Valley. The Altar Valley is a 45-mile (72 km) long north-south valley, trending slightly northeast from Sasabe, Arizona on the Mexico border to the Avra Valley west of the Tucson Mountains. 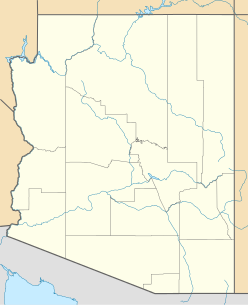 It is delimited by Arizona State Route 86, from east-to-west on the north separating it from the Avra Valley which then trends northwesterly, merging into the plains and drainage of the Santa Cruz River. The valley is traversed from north to south by Arizona Route 286. The major Baboquivari sky island range borders the valley on the west; the east is bordered by a series of mountain ranges, that have Nogales, Arizona nestled in between at the United States-Mexico border. Two wilderness areas lie to the west of the valley, the Coyote Mountains Wilderness east of Kitt Peak Observatory, and the Baboquivari Peak Wilderness. The center of the valley is near Baldy Peak (31°50′46″N 111°20′06″W﻿ / ﻿31.8462°N 111.3351°W﻿ / 31.8462; -111.3351﻿ (Baldy Peak (Sierrita Mountains))) in the southwest Sierrita Mountains. Baldy Peak's height is 4,120 feet (1,256 m). The Buenos Aires National Wildlife Refuge borders the southeast Altar Valley and covers half the valley's length. Sasabe, the U.S.-Mexico border town is surrounded by the refuge, including to the west. The lower elevation Cerro Colorado range borders the refuge to the northeast, the similar San Luis Mountains to the southeast. The mountains to the west and east associated with the Altar Valley. ^ Arizona Road & Recreation Atlas, pp. 86–87.